A reasonable fear means that the applicant does not have to prove conclusively that they will be persecuted in the future, but that they have a good reason to fear that it will happen. The person being persecuted fears that he or she will suffer a harm that is a serious threat to his or her life or liberty. Immigrating to the USA and applying for political asylum and succeeding can provide a great chance for the individual and his/her family to remain in the United States free from religious and political persecution. There are two ways that one can obtain asylum in the United States — either through the Affirmative process or through the Defensive process, both of which are immigration services available at the Law Offices of Diron Rutty, LLC. An applicant for Affirmative Asylum must be physically present in the United States. The applicant may apply for asylum status regardless of how he or she arrived in the United States or his/her current immigration status. Defensive Asylum applies to those requesting asylum as a defense against removal from the U.S. 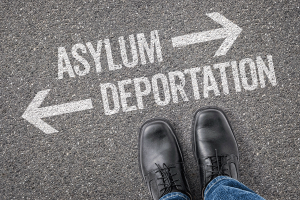 The Asylum process becomes defensive when you are placed in removal proceedings in immigration court with the Executive Office for Immigration Review (EOIR). Were caught by U.S. Customs and Border Protection (CBP) trying to enter the United States without proper documentation, were placed in the expedited removal process, and were found to have a credible fear of persecution or torture by an Asylum Officer (after receiving screening through the Credible Fear Screenings). SEEK LEGAL HELP WITH YOUR APPLICATION! The U.S. asylum process is very complicated, so the best chance of success comes by working with an experienced asylum attorney. At Diron Rutty LLC, our attorneys are highly experienced in United States asylum law. We have helped people from all over the world fleeing persecution to gain asylum in the U.S. Our attorneys and support staff will work with you individually to give you the best chance of success possible. We know how difficult and heart wrenching the asylum process can be, and we will be with you every step of the way. If you would like to discuss your situation, you can contact our immigration lawyers at 718-324-0404 in New York City, 845-849-9201 in Poughkeepsie, NY, use the form at the right, or email us at info@DironRuttyLLC.com.